A journey through the virtual worlds of Bebe Naidoo. Imagine my horror as I discovered this huge plum-sized creature living inside my basement bulkhead opening. Does anyone know what kind of spider this was? This is enough to give a girl arachnophobia. Just sent a link for this to a friend who is like the spider guru of all things creepy crawly...that is one UGLY spider! She is very interestingly pretty to look at up close and personal in the photo. She is very hairy! I also forgot to mention that there was a gianormous funnel-like web without a lid found in the same area. I just want to find out if they are venomous and if so, how much. 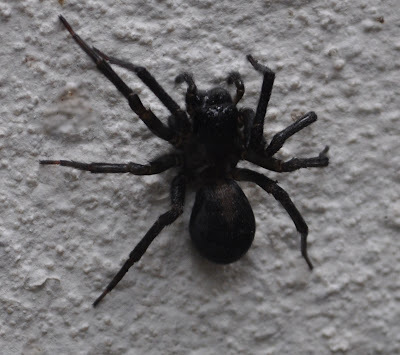 This spider is why I never go into the basement. I think this might be a trap door spider--I will be curious to know what you find out. Creative dabbler.Exploring digital media through Virtual Worlds as a means to get my art on. Lover of foods prepared well. Marie On Second Life - and Inworldz!